Notes: Turner B5. "embanked stone circle; an annular bank of earth and/or stones with an inner edge of orthostats. Internal diam 11m with bank 2m wide and 0.6m high. Only a few kerb stones remain (turner)." 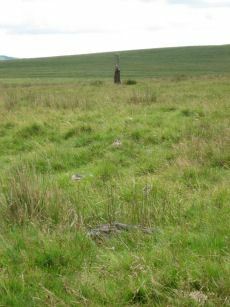 Notes: The Langstone standing stone is 2.76m high and can be seen from some distance. It was restored in its original socket in 1893. The Langstone is close to a stone row consisting of very small stones. The Langstone standing stone and also the stone circle were used for target practice by American troops who were stationed nearby during the second world. Bullet holes can be seen on the Langstone standing stone. Lethbridge pp.13-14. Notes: Dixon #65. Bar Rep. 55. Butler White Tor E.4. Vol. 2. Map 31.22 (diagram Vol. 5. p.174). Grinsell PETER TAVY 27. Notes: "A single stone row stands on Launceston (Langstone). Moor circa 330 feet in length, probably longer when complete. There are now only 18 stones, the largest of which stands only 18 inches above ground. At the north end are the remains of a barrow, now reduced to little more than a rubble ring. 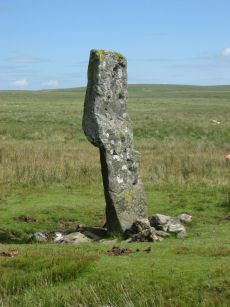 At the south end is the standing stone known as the 'Langstone', from which the moor probably takes its name. The stone was re-erected in 1893 and stands to a height of 9 feet 3 inches." Lethbridge p14, diagram p13. 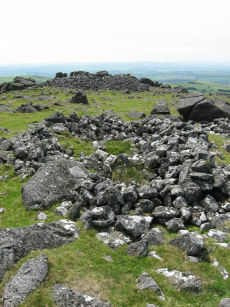 Notes: A prehistoric Tor cairn with a diameter of approximately 14.3m. Notes: Turner D15. Butler Standon Hill W - Vol. 2. Map 32.17 (diagram Vol. 5. p.182). Grinsell PETER TAVY 15. Doubtful cist. "A disturbed cairn measuring 5.2m N to S by 6.0m and standing a maximum of 0.3m high. Eight large upright slabs and boulders, up to 0.6m high, lie on the fringe of the mound to create a substantial retaining circle. 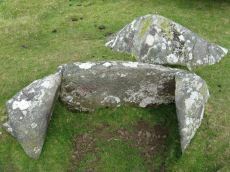 There is no evidence to suggest the presence of a cist though is seems likely that the interior of the cairn has been used as a repository for cleared stone. A large number of relatively recent clearance cairns lie in the immediate area." Notes: See also duplicate 439800. Turner A26. Butler White Tor E.1. 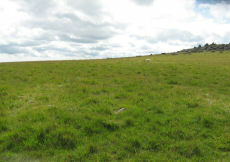 "Round cairn 340 metres east of White Tor summit. This monument includes a round cairn situated on a gentle south-east facing slope overlooking the valley of the River Walkham. The cairn mound measures 6m in diameter and stands up to 0.4m high. A hollow in the centre of the mound measuring 3m in diameter and 0.3m deep is the result of a partial excavation carried out by the Dartmoor Exploration Committee in 1899. This work recovered a perforated stone. A kerb of small stones defines the outer edge of the mound." Notes: Neolithic tor enclosure. 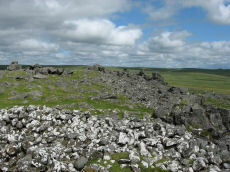 "A camp on the summit of White Tor formed by a double wall, now in ruinous condition. Both walls appear to have been 10 to 11 feet thick, the outer wall being 4 to 4 1/2 feet high, the inner 6 to 7 feet high. The distance between the walls varies between 10 and 40 feet. The entrances are to the east, where access is easier, they are not opposite and are protected by the spur walls. Within the camp are four hut circles and three possible hut shelters, and two northern circles (numbers 5 and 6 on plan) are joined by a short wall." See also, Legendary Dartmoor: Dartmoor's White Tor Neolithic Settlement. See also HER record MDV4102.